Hydrate the skin with glycerin. Accelerates the disappearance of inflammatory lesions and superficial retentional thanks to lupine peptides, known for their soothing and anti-irritant. 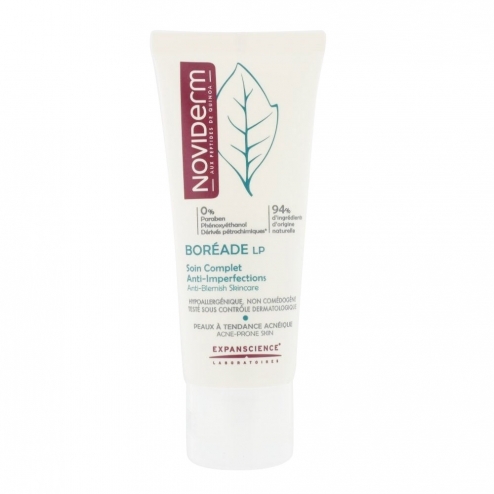 Improves skin relief with salicylic acid, AHA AHA and extended-release, known for their exfoliating action. Prevents the appearance of imperfections with a complex asset matting (5 Avocuta α), astringent (zinc gluconate) and purifying (capryloylglycine). Soothes and repairs the skin with peptides of quinoa. Apply morning and evening on clean dry face avoiding the eye area, ideally for 2 months for optimal results. Formula INCI: Aqua (water), Lactic acid, Lactic acid, arginine, Glycerin, Caprylic / capric triglyceride, Oryza sativa (rice) starch, cetearyl alcohol, Butyl Avocadate (5 Avocuta α), Hydrogenated palm kernel glycerides, hydrogenated palm glycerides, glycerin, lauryl glucoside, polyglyceryl-2 dipolyhydroxystearate, Dicaprylyl carbonate, Silica, Zinc gluconate, Sodium stearoyl glutamate, Xanthan gum, Sclerotium gum, Glyceryl caprylate, Hydrolyzed lupine protein, Hydrolyzed quinoa seed chenopodium, maltodextrin (peptides quinoa), Sodium cocoyl glutamate , disodium cocoyl glutamate, Propyl gallate, sodium hydroxide, Salicylic acid, Pentaerythrityl distearate, Capryloyl glycine, fragrance (parfum). Paraben-free. No phenoxyethanol. No petrochemical derivatives. 94% ingredients of natural origin.